A reputable tree surgeon is an incredible asset. There are many elements of the work that can go wrong and the results can offer terrible consequences. We were asked to fell this Sycamore tree in Stockport. From the first image you can see how large the tree was beside the house. Overgrown trees are knowingly problematic. The trees can restrict the light and the roots can cause problems for paving and buildings alike. Our client wanted the tree to be felled and wanted to find out more about their options. The following images show the stages of the tree removal. Our skilful staff are trained in order to complete the process carefully and safely. We use all of our own machinery which is cared for and looked after in order to ensure its safety. We take great pride in our work and enjoy taking on challenging tree surgery work. You will find that a lot of our competitors are not able to take on some of the larger tree removal work. Proximity to your house can play a pivotal role on the success of the job. Loose or falling branches can cause damage to your home so it is vital that this is avoided. Once the tree had been cut down, the light flowed into this beautiful home. As part of the service we remove all of the branches. We have incredible wood chippers that successfully break down the branches. This powerful machinery is carefully selected through our experience in the trade. 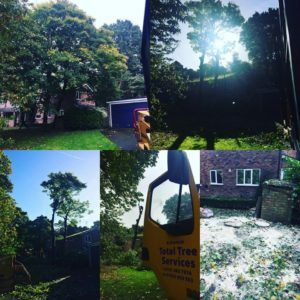 Are you looking for tree surgeons serving Stockport? We have many more images of the local work we have completed on our Facebook page. Our aim is to make it easy for you to enquire about our tree services; we will answer your questions promptly. Get in touch today to find out more about how we can help you on 07855 859983. We are available 7 days a week, 24 hours a day!